A magazine called 'Living Space' which was an exterior and interior design style publication carried out reviews on various properties included some architectural design projects carried out by this firm. 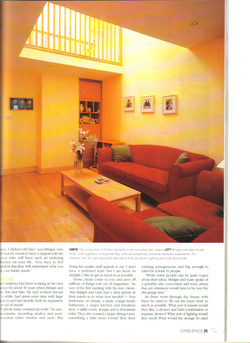 One was an internal refurbishment and small rear extension to a detached residential property in Stillorgan, Co. Dublin. 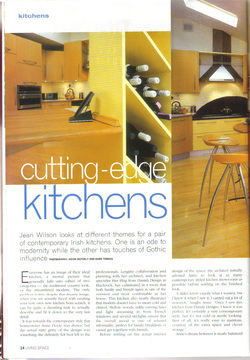 It was featured in the magazine to highlight the different themes for a pair of contemporary Irish kitchens - one being an 'ode to modernity 'and the other has 'touches of Gothic influence.' Our proposal was for a modern, contemporary style with mellow woods,soft curving lines and light streaming in from French windows and the use of several rooflights to ensure that the overall mood was one of relaxed informality, perfect for family breakfasts or casual get togethers with friends. Another project was a complete redesign of a semi-detached house in Glenageary, Co. Dublin which entailed both ground and first floor extensions and the provision of a a centre 'light well' in the middle of the house lit from above with rooflights. 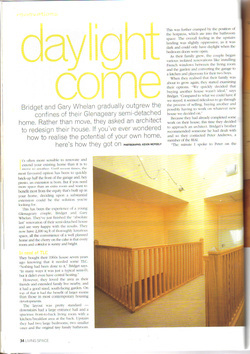 This allowed for lots of natural daylight to flood down through the first floor and into the ground floor below allowing that nearly every room and corridor is sunny and bright.